Certance has been purchased by Quantum. Please click here to access the complete line of Quantum storage related solutions and tape drive, autoloader and library configurations. Up to 864GB solutions for small to mid-sized networks. Certance data cartridges meet stringent standards for outstanding performance. Certance LTO, DDS-DAT, Travan Tape Backup and Tape Drives Wholesale distributors of data storage drives, tape libraries, storage media and archival solutions. 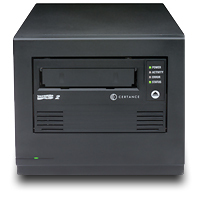 Certance LTO, DDS-DAT, Travan Tape Backup and Tape Drives Since 1991, 9 TO 5 COMPUTER has been providing such top tier products to corporate data centers, government , VAR's, resellers, OEM's, and wholesalers throughout the entire global marketplace.